Our Big Island Travel Guide will help you get to wherever you are going on the Big Island. With over 4,000 square miles (more than 10,400 square km) to explore, this is a very big playground! In fact the Big Island is nearly double the size of all the other Hawaiian Islands combined. Considering how big the Big Island is, it's really very easy to navigate. The two main roads are Highways 11 and 19, creating one big loop around the entire island. Highway 11 stretches 125 miles (201 kilometers) around the south of the island between Hilo and Kailua-Kona, and Highway 19 winds around the north, 98 miles (158 k) from Hilo to Kailua-Kona. Highway mileage markers start at zero in Hilo. The numbers (miles) increase as you drive north, south and west. SO, whether you are on Highway 11 going around the south or Highway 19 going around the north, the mileage posts along the highway tell you how far you are from Hilo. Because roads on the Big Island are often narrow and winding, distances are typically given in time rather than mileage. Traveling south on Highway 11 from Hilo to Kona will take close to 3 hours, and driving Highway 19 around the north will take about 2 hours. The speed limit never exceeds 55 mph (88 kph). Highway 200 (the Saddle Road) is the only highway that crosses east-west through the middle of the Big Island, winding 51 miles (82 km) across the saddle that runs between Mauna Loa and Mauna Kea. 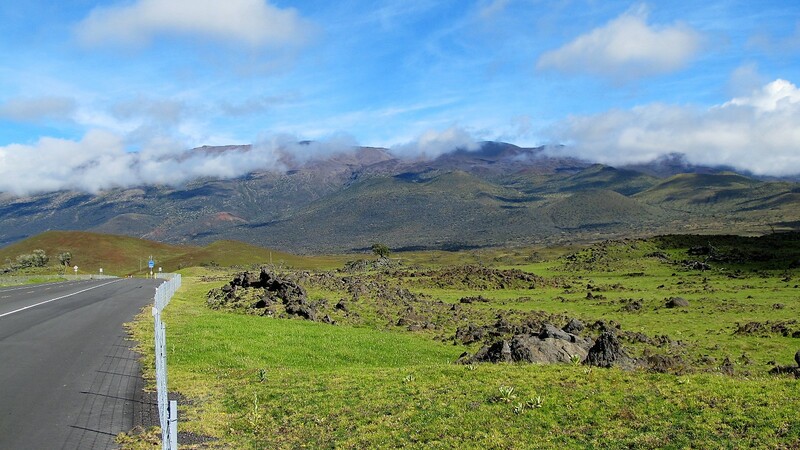 On a clear day this is a very scenic drive, offering expansive views as you cross the saddle between these mammoth volcanoes. If you are in a hurry to get across to the other side of the island, this route can shave about 30 minutes off the northern route (Highway 19). What was for many years little more than a moderately improved trail, this stretch of highway was so treacherous that rental car companies included a clause forbidding its use. After many years of extensive work, the Saddle Road has been beautifully redesigned and vastly improved. 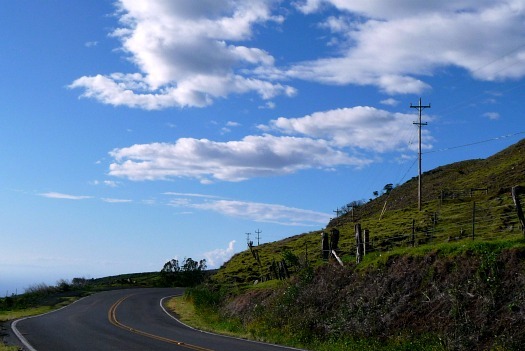 Today this vital link between east and west is perhaps the nicest highway on the Big Island. The new section of Route 200 on the west side is called the Daniel K. Inouye Highway. It begins approximately 14 miles south of Waimea and 25 miles northeast of Kona on State Route 190 (Mamalahoa Highway). The east side has also been rerouted, and is now much more of a straight shot into downtown Hilo. In inclement weather, the Saddle Road can be a real nightmare. Thick fog and low-lying clouds can make for limited visibility. On the whole though, this stretch of highway is incredibly scenic. 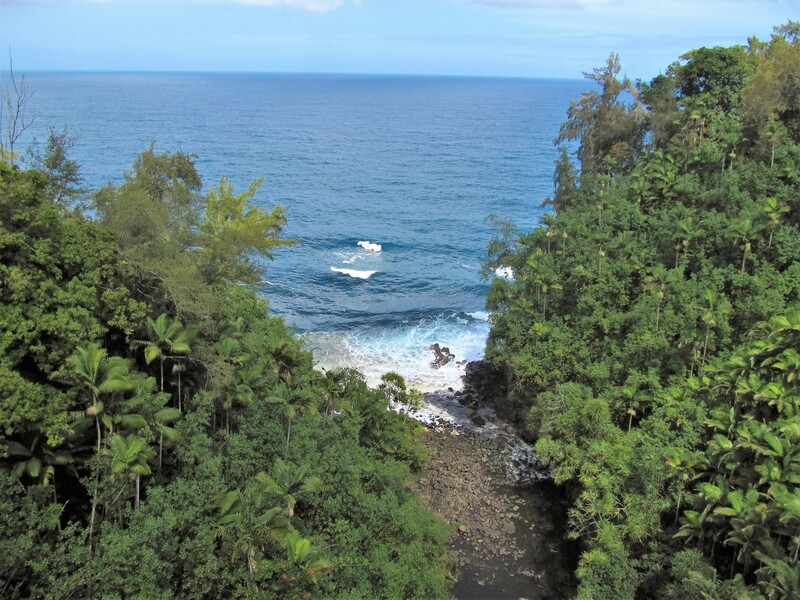 One of our favorite scenic drives winds 55 miles along the Hamakua coast, Highway 19 between Hilo and the northern town of Waimea. There are many waterfalls and dramatic views of the east coast along this stretch of highway, in addition to a number of scenic byways and diversions. Take your time! 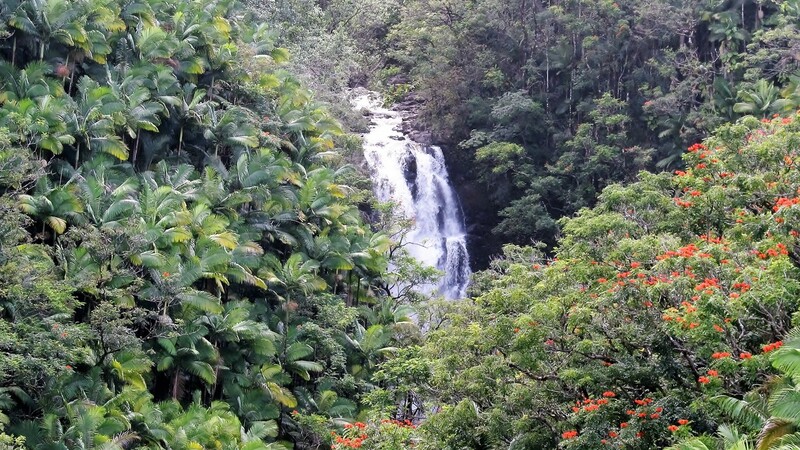 Make a day of it and continue northwest from Waimea to the cute artist community of Hawi. Known as the Kohala Mountain Road, Route 250 is a 40 minute stretch of scenic highway running across the upper flank of the Kohala volcano. 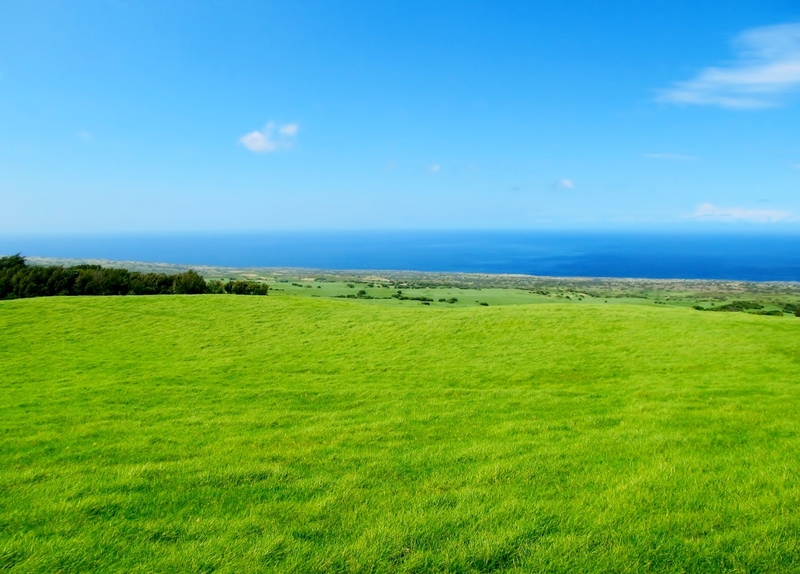 The Kohala Mountain Road offers stunning views of the west coast as it stretches across the grassy slopes and sparsely wooded areas of Kohala Volcano. 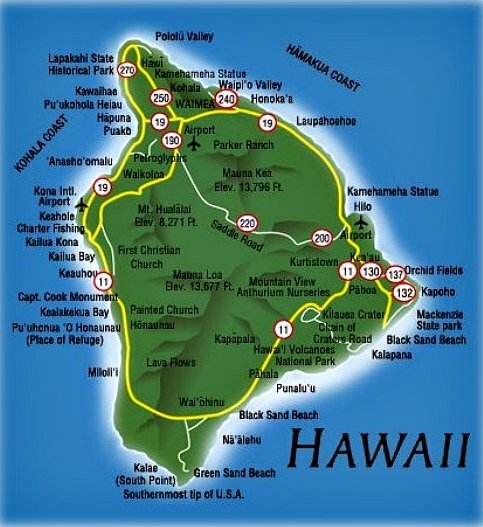 Begin in Waimea, drive west 2 miles (3.2 km) on Highway 19, then veer right (northwest) onto Highway 250. There are two commercial airports and two seaports on the Big Island. When you fly into Kona International Airport on the west side of the island, don't be dismayed by the barren landscape! The airport is built on the lava flow from the 1801 Hualalai volcano eruption. It is arid and bleak, but what better place for an airport, right? Trust us, it gets much better as soon as you leave the airport! When you leave the Kona airport, you can head either north or south along state Highway 19. The village of Kailua-Kona is 15 minutes to the south, and the Kohala Coast resorts are 15-30 minutes to the north. When flying into Hilo, the landscape is naturally more lush. Hilo is on the edge of a tropical rainforest and receives more than 100 inches more rainfall per year than the coastal region north of Kona. As you leave the Hilo airport, Highway 11 heads south toward Volcano and Highway 19 heads north along the east coast. Before you leave the airport, grab a couple of the free tourism pamphlets. They will prove useful as a Big Island travel guide since most of them include a nice map of the Big Island. Otherwise you can find a Hawaii Big Island map at most gas stations and convenience stores. Even in the era of GPS gadgets on everything, a real map is a nice addition. Try not to be in a hurry. You're in Hawaii! Slow down and enjoy the impressive scenery. Some stretches of road are not well marked, and if you rush you may miss that hidden turnoff to that secret beach you were looking for. Plus, most police drive their own cars, so you often won't be able to tell when they are right next to you. And speedtraps are not uncommon. Wherever you go, try not to look too much like a tourist. In other words, secure your car by not leaving anything in sight that might be tempting to a potential vandal, especially in remote parking areas near beaches or trailheads.